The weekly Fighting Back post is also an Open News Thread. 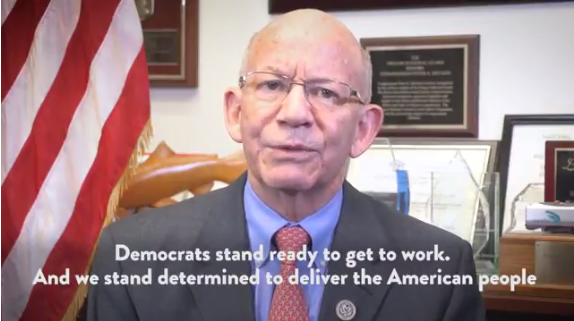 The Weekly Democratic Party Address was delivered by Rep. Peter DeFazio of Oregon. The administration must offer an infrastructure plan that strengthens the commitment to the national transportation network by providing stable funding for more than a year. Trump’s plan is embarrassingly small. Democrats have announced a better deal to rebuild America. This infrastructure plan is five times bigger than his proposal. One trillion dollars to rebuild crumbling roads, schools, extend high-speed internet to every family in America. […] We must strengthen the federal commitment to the national transportation network of providing stable, long-term funding. If the president and congress are serious about prioritizing infrastructure, they have a unique opportunity to make badly needed investments. But they have been avoiding this for decades. Democrats are ready to get to work and deliver to the American people a better deal, jobs, wages and future. Transcript from CSPAN, lightly edited: Congressman Peter DeFazio (OR) delivered the Democratic Weekly Address, giving his reaction to President Trump’s infrastructure proposal. The federal commitment role in building our national infrastructure is as old as the country itself. The first president believed it was important to build the country from east and west. Dwight Eisenhower created and funded the interstate highway system, linking the nation like never before. It was important the federal government recognize the critical important in public transit systems. Congress had a vision of a national transportation system that binds the nation’s economic well-being, security, and people together. But the trump administration wants to abandon this bipartisan history to a national infrastructure network. We would expect the [vulgar talking yam] to release a plan that devolves public transportation to the pre-Eisenhower era, to encourage the selling off of roads, bridges, and transit systems to corporation. — to corporations. This system didn’t work. The Kansas Turnpike, for example. Oklahoma delayed the project for 18 months before the Eisenhower plan. The White House would take it back to this disjointed system. This shifts the burden to cash-strapped states and local governments. It would cut existing transportation programs to pay for Wall Street. It would cut bedrock, environmental, and clean air protections under the guise of cleaning up projects. This is another scam to privatize critical government functions and create windfalls for Wall Street. This proposal would not address serious infrastructure needs facing this country. Bridges and transit systems already dangerous — become more dangerous. Tolls become higher. The administration must offer an infrastructure plan that strengthens the commitment to the national transportation network by providing stable funding for more than a year. Trump’s plan is embarrassingly small. Democrats have announced a better deal to rebuild America. This infrastructure plan is five times bigger than his proposal. One trillion dollars to rebuild crumbling roads, schools, extend high-speed internet to every family in America. These are American jobs that cannot be exported. Bridges need to be replaced. Building bridges means work for American citizens, engineers, architects. A public transportation system with a backlog of critical investment needs. And with federal transportation dollars comes from requirements to buy American manufacturing and jobs. This also supports small businesses owned by minorities and veterans. America back to work and to get America moving again. We must strengthen the federal commitment to the national transportation network of providing stable, long-term funding. If the president and congress are serious about prioritizing infrastructure, they have a unique opportunity to make badly needed investments. But they have been avoiding this for decades. Democrats are ready to get to work and deliver to the American people a better deal, jobs, wages and future. Leader Nancy Pelosi’s did not give a news conference on Thursday. She was probably resting from her 8 hour an 7 minute House floor speech! Her office did share this information about the first 400 days of the 115th Congress. 69: Times House Republicans have voted to repeal or undermine the Affordable Care Act since 2011. More media reaction at the link. Thanks for this post, Jan. This is what we get for electing a gang of thugs who know nothing and care less about how government works—who, in fact, have no conception of even the purpose of government. I know we didn’t all vote for the thugs, but gerrymandering, Comey, the Russians, and Saint Bernard, were enough to do us in. What we’re all realizing, what even the pundits apparently are beginning to realize, is that the bedrock of democracy is very frail indeed.